It was a "Reunion" indeed when Nikita and Amanda finally came face-to-face again. 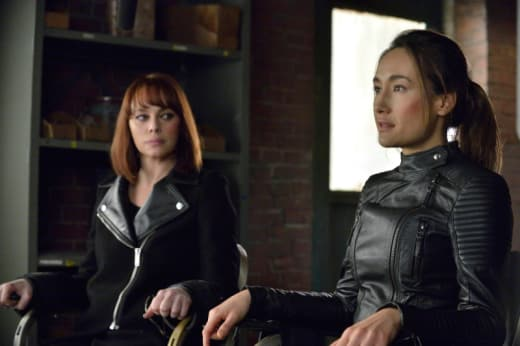 After a slow start to Nikita season 3 - with the search for the Dirty Thirty and Amanda as a foe - the show has regained its season 2 momentum these last few episodes. Amanda started out as a weak replacement for Percy, but she has developed into a challenging nemesis for Division and Nikita. Initially, her resentment and focus on Nikita didn't really make sense, which muddled the story. But her motivation is finally clear now, even if highly convoluted. Nikita broke Amanda. I didn't see that one coming, did you? Amanda's behavior certainly has been worthy of a trip to the loony bin and Alex figured it out why. When Nikita spared Amanda's life, it didn't spark a renewed humanity, instead it awakened the worst within her. Ari further explained that Amanda didn't see Nikita's act of mercy as a gift, but rather as a personal failure. That explains her desire to teach both Nikita and Alex lessons, like when she put a bomb on Cyrus. Amanda wouldn't kill Nikita then, but will she now? Perhaps eventually, but for the time being, she'd rather cause Nikita as much pain as possible. The smackdown between Nikita and Amanda was definitely enjoyable to watch. It's too bad that Krieg showed up and interrupted Nikita. We'll have to wait to find out if she can bring herself to kill Amanda. Even with the lives that Amanda has taken, I doubt Nikita would have killed the unconscious Amanda. As disappointing as Krieg's arrival was, it provided for a heartfelt moment between the two women. Believing she was on the verge of dying in a fire, Amanda opened up a bit about her past. This wasn't her first experience with fire, but how that relates to her ending up in Division will have to wait. I never thought I'd feel any sympathy for Amanda again, but in that moment Melinda Clarke did an amazing job showcasing Amanda's vulnerability. And, for a second, I felt for her ... maybe a few. Daddy issues? After not caring much for Amanda, I'm intrigued by her again. 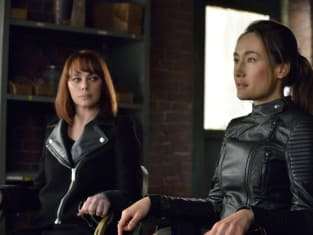 The challenges of the new Division weren't an issue this week, but Amanda's belief that Alex will one day turn on Nikita as she did on Amanda adds to that "history will repeat itself" fear for the organization. Alex has turned on Nikita before, so it's not outside the realm of possibility that it will happen again, but it would be a shame to see. Now, that Amanda has Alex in her custody, will she use her mind manipulating skills on Alex? Whatever Amanda plans to do, it will certainly involve hurting Nikita. The story of Stefan, his father and his protector was eye-opening for Nikita's future. Without Michael, Nikita could turn out to be Krieg with no desire to retire. I'd love to see Nikita be more determined than ever to marry Michael and live a happy life together. And, perhaps even experience the love of a child? Though, Stefan's situation also was a reminder of their dangerous work and whether they would want to raise a child under those circumstances. With Cassandra and Max in hiding, Michael's son could become a target just like Stefan. Foreshadowing? I hope not for a long time! What happens next will really be determined by Amanda based on what she decides to do with Alex. Based on the preview, it looks like a sacrifice will be made in order to get her back. If Sean finds out, could that be a breaking point for him regarding Division? With Owen out of commission due to his inability to control himself, they will need Sean to keep his emotions in check. Did you feel empathy for Amanda at all during the fire? Would Nikita have killed the defenseless Amanda? Will Owen ever learn to control himself? Sorry, about your face. When I break these chains, I'll even out the other side. Nikita: No boys needing rescuing. Maybe one. Permalink: No boys needing rescuing. Maybe one. There's always one.